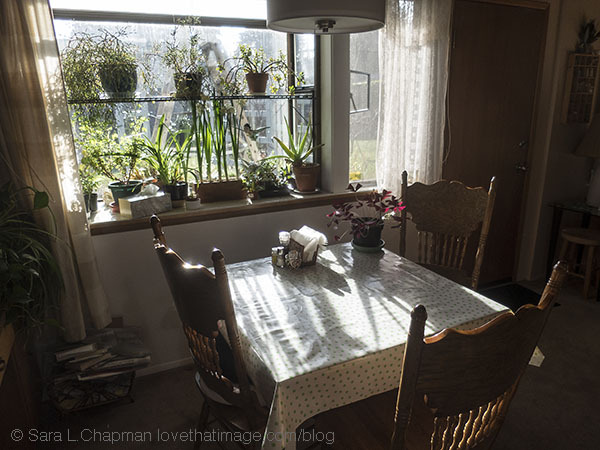 I don’t just love your tablecloth, I love your plants and the sun shining through the window! I miss the sun now we’re in deepest, darkest winter. I love the whole look with the plants in the window. The polka dot pattern reminds me of Emma Bridgewater which is popular in the UK. Your kitchen looks very cozy! Your kitchen looks so cozy with these green curtains. Shadows on tables…can they be good enough to eat?